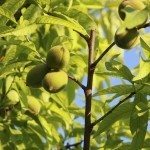 how do I know if my peach tree has a disease? I have a dwarf peach tree. I have fertilized it with 10-10-10 and I give it plenty of water, but the leaves are small and they look deformed. I've had it for 4 seasons and it has yet to produce any fruit. What am I doing wrong?